-Bill Mastro, Doug Allen and Mark Theotikos had a status hearing on October 15th in US District Court in Chicago as they await sentencing based on their guilty pleas entered earlier this year. According to papers filed in Chicago, all three men are scheduled to appear in court again for another status hearing on November 14th. -Forbes published a profile of Scheinman in 2012 showing a jersey in his collection attributed to Bobby Thompson from the “Shot Heard Round The World” game in 1951 as well as others with game-use attributed to Dizzy Dean and Chuck Klein. Forbes mentioned his ownership of other jerseys attributed to several 1927 Yankees players, Lou Gehrig, Jackie Robinson, Stan Musial and Ted Williams and also noted that Scheinman’s first significant purchases were made at the 1999 Barry Halper sale at Sotheby’s. Some of Scheinman’s jerseys have made the rounds through the auction and show circuit with previous sales from “dubious sources” including Wolfers Auctions, Grey Flannel, REA, Barry Halper, Lou Costanza and MastroNet. Scheinman has purchased several jerseys that have passed through Mastro auctions including Dutch Reuther’s 1927 Yankee road uniform and Christy Mathewson’s c1901 New York Giants jersey (sold by REA/MastroNet in 2000). Scheinman, a life-long Giant fan who purchased his stake in the club in 2001, declined comment on whether he is questioning any specific Mastro-sourced jerseys in his collection. 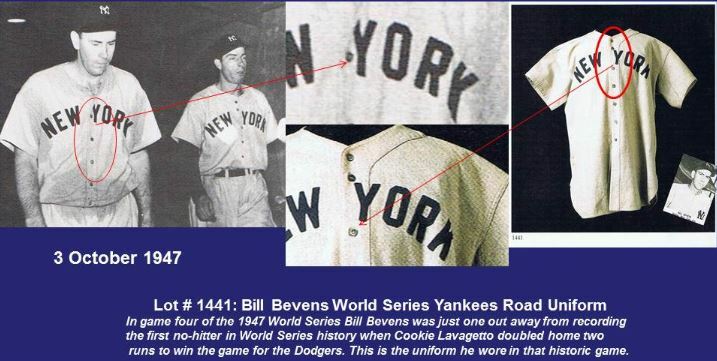 -Dave Grob, the MEARS senior uniform authenticator, told us he did not examine the Bevens jersey for the Heritage sale. Readers may recall similar authenticity issues with a baseball Barry Halper sold as the actual ball that broke up Bevens’ no-hitter during that same game in the 1947 Series. -Forbes writer Eric Savitz quoted Dan Scheinman calling his collecting focus as the “murky world of jerseys” and, from our perspective, it looks like Scheinman may have avoided scores of fakes and frauds that were offered by Halper and Lifson at Sotheby’s in 1999. 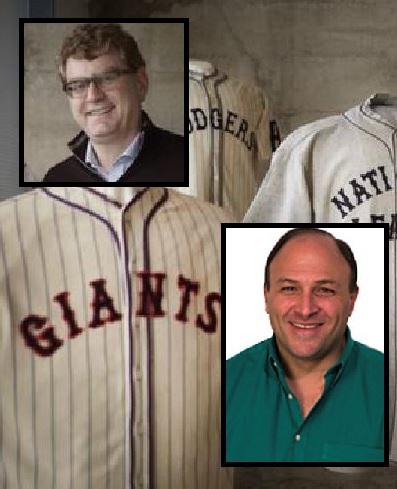 Scheinman’s MLB partners, however, were not as lucky when Bud Selig passed along their money to the Baseball Hall of Fame to purchase millions of dollars worth of fake items from Halper including jerseys fraudulently attributed to “Shoeless” Joe Jackson, Mickey Mantle, Jackie Robinson and Buck Leonard. Ironically, in his report, Savitz identified several other fraudulent Halper items as being genuine including Lou Gehrig’s last glove, Mickey Mantle’s c 1960 glove and Ty Cobb’s dentures (which are believed to be an Al Stump created fake). 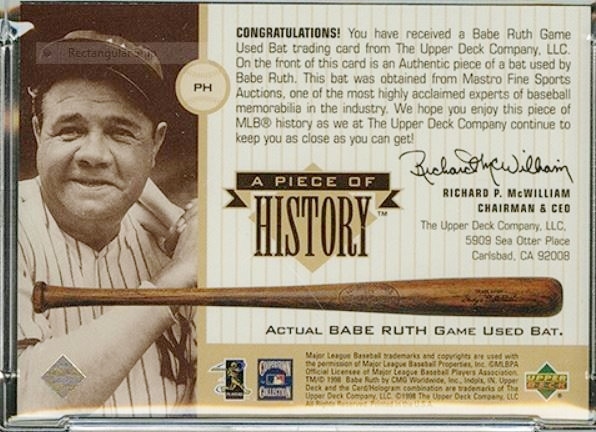 REA sold this Upper Deck "Pieces of History" Babe Ruth bat card for $2,500. The back of the card pictures the bat that was allegedly cut up and reveals that it was purchased from Bill Mastro and Mastro Fine Sports. -Upper Deck’s “Pieces of History” Babe Ruth game-used bat relic card sold for $1,200 in REA’s auction last week and the buyer could probably benefit from the types of revelations Scheinman would like to hear from Bill Mastro. As indicated on the back of the card Mastro was the seller of the alleged game used Ruth bat that was cut up and destroyed by the trading card company. The card reads: ”On the front of this card is an Authentic piece of bat used by Babe Ruth. This bat was obtained from Mastro Fine Sports one of the most highly acclaimed experts of baseball memorabilia in the industry industry.” Sources indicate that Mastro and other auction executives (and experts) supplied the trading card companies with questionable and problematic game-used bats which did not feature the size and weight specifications that would pass as “game-used” in their own auctions and sales. In addition, the bat illustrated on the Upper Deck card sold at REA does not appear to be one ever sold in a Mastro auction. We compared the bat depicted to all of the Mastro bat sales dating back to 1997 and could not locate it. Panini and Upper Deck have created fraudulent "relic cards" like a Jim Thorpe uniform card and other cards with bat fragments attributed to unverified game-use by Babe Ruth and "Shoeless" Joe Jackson. -Heritage Auctions is currently offering a Babe Ruth relic card alleged to house a piece of the Bambino’s actual game used pants. It would be nice to know which Ruth pants were used to create this card and how the card company determined the pants were authentic and actually worn by the Bambino. Heritage says the uniform fragment is “a swatch of grey flannel that once served as part of Ruth’s road uniform.” The current bid on the PSA-graded card is $1,700 with a “$3,000 and up” estimate. -eBAY is currently offering for sale on its auction site many fraudulent “relic-cards” produced by Panini (and Donruss), Upper Deck, Topps and Leaf. Like the two bat cards offered by REA and the Ruth “pants card” being offered by Heritage, the offerings show that the card companies have done little due diligence before creating and marketing these products to consumers. Amazingly, these fraudulent materials (many of which originated with former MLB minority partner Barry Halper) have been endorsed by the Baseball Hall of Fame and Major League Baseball and are currently playing a role in an on-going case of consumer fraud. In the course of our own on-going investigation into fraud related to “relic cards” we have confirmed that Heritage Auctions has sold a significant number of cards made from these bogus materials. Look out for more on this in our upcoming reports. The website (left) for the class action lawsuit against Bob Eaton's RR Auctions posted information stating that PSA/DNA and attorney Keith Attlesey (right, top) failed to appear for depositions last week. Sources say PSA has rejected service of subpoenas for Steve Grad and Joe Orlando. -Michael Johnson, the collector who is the plaintiff in the lawsuit declined comment on the case but said that the lawsuit website would be updated with new information early this week. 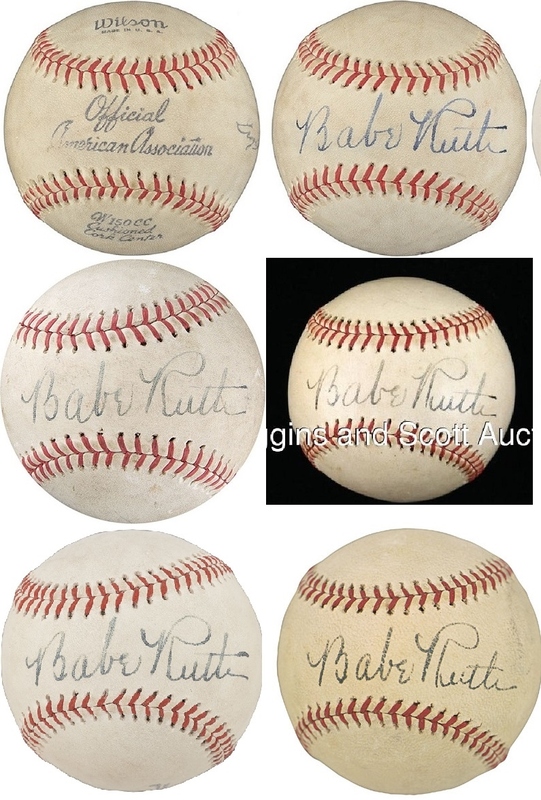 The Babe Ruth ball sold by REA last week was signed on an American Association Ball just like four others sold at auction since 1998. A close up of the alleged Babe Ruth suitcase sold at REA reveals that the gold embossed name was applied on top of pre-existing wear and tear to the leather bag. -Linda Ruth Tosetti, the Babe’s granddaughter, is very skeptical of the suitcase sold by REA and told us she has a genuine Ruth suitcase that has been in her family since the 1940s and shows consistent wear. There is no existing evidence to support Halper’s claims that he purchased items directly from the Ruth family and as readers may recall it was Halper who lied about purchasing Ruth’s 1927 World Series ring from Tosetti’s mother, Dorothy Ruth-Pirone. A 1917 letter written by Branch Rickey to August Herrmann was withdrawn from Heritage Auctions' current sale under suspicion it was stolen from the Hall of Fame. -The National Baseball Hall of Fame has still not honored our FOIA request for documents related to the stolen 1909 Pirate photo that was pulled from the recent Huggins & Scott sale. In addition to that incident being investigated by the local Cooperstown Police, another item stolen from the Hall’s National Baseball Library appeared in Heritage’s current sale but was pulled after HOS identified it as a stolen item on Twitter. The letter was slated as Lot #82800–a 1917 letter written by Branch Rickey to August Herrmann as the Vice President of the St. Louis Cardinals. Jimmy Spence (right) has been in the news for his authentications of items signed by Heisman winner Jamies Winston. MEARS Auctions sold an alleged 1931 Green Bay Packer signed football for over $13,000 with an LOA issued by JSA. Experts, however, say the signatures are not genuine and contrast authentic examples, one of which JSA previously authenticated on a 1938 Packer football. -Troy Kinunen, of MEARS, told us that when JSA issued its full LOA for the 1931 Packer football, the alleged signature of Arnie Herber was identified as a secretarial. I’ve got to wonder if there’s anything for sale that isn’t fake or stolen? I understand a percentage of sellers are corrupt but how anyone can feel confident that their purchases are what they’re promoted as if companies like Topps and Upper Deck can’t be trusted? I see that the auction of the football before the authenticator opined on it and before the certficate was issued. Wonder if that had any effect/pressure to issue a cert on an auction item that was already listed and live bids being taken? Why is PSA playing hide and seek? Because they got their hands caught in the cookie jar and they have lots of liability. Cant wait to hear why Steve Grad lied under oath about graduating from college and about how bill mastro trained him. Maybe Rick Harrison and Pawn Stars will get dragged into this mess. I lost all interest in that show when steve “not the grad” grad came on board. Is grad signing anywhere this weekend? Grad and Spence are two of the most unethical and incompetent figures in the hobby. The scam they call authentication needs to be federally regulated. Every time I see that clown grad on pawn stars it turns my stomach. We all know the show itself is scripted and not reality TV but having a guy who passes off so many fakes as genuine he kind of fits right in. How does MEARS put that type of bogus item (the alleged 1931 Green Bay Packers autographed football) in its auction in the first place? 15 minutes of research would have been enough for nearly anyone with even the most rudimentary level of hobby knowledge to know that the signatures were not authentic. Why even send the football to JSA? Seems like a pretty straight-forward, $13,317 scam. The buyer needs to be properly informed. Troy Kinunen, are you reading this? There’s a lot more wrong with the football than the Arnie Herber autograph (not “Herbert” as you write in the auction). Give the winning bidder his money back. If MEARS/Troy Kinunen engage in these sorts of ridiculously deceptive tactics on a $13,000 auction lot, I can only wonder how many other times and in other auctions they have deceived their customers. What makes these guys autograph experts? Look at their credentials! It’s a joke. None of them, including JSA, PSA, SGC, etc. have ANYONE on their staff that are actually Forensic Document Specialists. You read that they have been avid collectors for years! Are you kidding me? I have been an avid collector too! Does that make me an expert? Come on. These authenticators are middle men that are profiting because people continue to pay the fees. I had a verrry notable Military general authenticated. They never heard of the general, because the person doing the authenticating was a college kid of the owner. In additon, there were no known examplars out there to compare on the internet. I love the baseball memorabilia market and the baseball card market and this site just makes me re-think so many auctions that I’ve followed over the years. I thoroughly enjoy the HOS website and articles and their in-depth research into items being sold at auction as “genuine”. Hard to believe there is so much out there that is considered forged/fake and well, never mind money is involved. Thanks for this insightful and well researched site. Hope to see more on the Gretzky Wagner and the outcome with Maestro and his colleagues.